Maybe this could have benefitted from multichannel but we don't hear enough of acoustic instruments in real space today, so you've got to applaud Acoustic Triangle's efforts. Especially if they help alert more people to the danger of some wonderful buildings being pulled down. Malcolm Creese, the British double-bassist, can't pass a church without going in - to experience the light, colours, the architecture, and most of all the sounds. Creese combined his love of churches with his devotion to unplugged music and an enterprising search for an unlikely new club circuit when he set up this year's 28-dates of ecclesiastical venues for Acoustic Triangle - featuring sometime Chick Corea sax sideman Tim Garland and newly arrived piano prodigy Gwilym Simcock. Resonance features 10 pieces, by the band's members and by Kenny Wheeler and Stan Tracey, recorded live at Romsey and Dorchester Abbeys. Delicately nuanced chamber-jazz it certainly is, but there's plenty of muscle and energy, with Garland sounding full-bodied and exultant as well as pure-toned and lyrical, Creese surefooted and mellow, and pianist Gwilym Simcock frequently dazzling, especially on a tumultuous unaccompanied feature. Garland's bass clarinet and Simcock's French horn make the soundscape surprisingly wide, and though much of it is light-stepping and soft, a lot of it swings, and the Stan Tracey piece is positively Ellingtonesque. Eugenio Montale has written about the second life of art, that having been exposed to it, it must inhabit our imagination, using the example of a theme from the opera being whistled in the street or a phrase by a poet quoted in conversation. The strangely beautiful music on Resonance succeeds in doing much the same; its themes playing and replaying in the mind when you least expect it. The ethereal quality of this music speaks in many tongues and invites many interpretations. But from whatever premise such evaluations are made they will have to acknowledge the primacy of musical values that remain eternal - melody, its presentation and the variations that flow from it, harmony that can move in unexpected directions and rhythm, whether rubato or implicit, that is the lifeblood of these compositions. The interesting thing about the choice of repertoire, recorded live in Romsey and Dorchester Abbeys, is not whether it is a classical theme (Miserere Mei), an original by Kenny Wheeler (Everyone's Song But My Own), Stan Tracey (Under Milkwood) or one of the seven originals by either Garland or Simcock, it is how the group inhabit each piece from within and stamp it with their joint personalities to make this such a successful joint endeavour. Acoustic Triangle is possibly the finest chamber jazz outfit working in the UK at the moment. Led by bassist Malcolm Creese and comprising Tim Garland (winds) and rising star Gwilym Simcock (piano, French horn), they live up to their name by playing (most of) their gigs entirely unamplified. This CD was recorded on their recent tour of sacred buildings and features performances recorded at Romsey and Dorchester Abbeys. The trio explores these fantastic acoustic spaces with grace, delicacy and muscle. Folkish melodies, Italian church music and old chestnuts from Kenny Wheeler and Stan Tracey rub shoulders in a thoughtful, engaging set that knocks spots off the pale, tired atmospherics of the current ECM crowd. For their third album (their first featured John Horler as pianist), Acoustic Triangle - bassist Malcolm Creese, saxophonist Tim Garland, pianist Gwilym Simcock - have produced a record of their recent tour of UK churches (Creese's eloquent liner note expounds his belief that these currently under-utilised buildings could be rendered useful to their respective communities by hosting concerts rather than housing dwindling numbers of worshippers). Their preference for playing entirely acoustically makes for a pure-toned group sound peculiarly appropriate to church acoustics, and their material - mostly Simcock and Garland originals, but including Kenny Wheeler's celebrated 'Everyone's Song but My Own' and Stan Tracey's 'Under Milkwood' - is perfectly judged, whether dancing, sprightly themes featuring Garland's agile soprano ('Bourdion') or tender, wistful tenor ('As the Boy Gathers His Dreams'), or pieces showcasing Simcock's lyrical, rippling piano under bass clarinet ('From the Land'), or tricksily good-natured group interplay ('Fundero'). Informed by all three men's assurance in the fields of classical, folk and improvised music, this is a gem of an album, elegant, delicate and supremely tasteful, but imbued with sufficient jazz spirit to render it unequivocally enjoyable. Unreservedly recommended. In a 2003 interview, drummer Peter Erskine spoke about playing in concert halls with such inherently good acoustics that PA systems were unnecessary. "...audiences love it, they absolutely love it. The world has gotten so noisy, and things have gotten so dense and assaultive, that people are grateful for a chance to rest their ears, rest their spirits and maybe their psyches." Acoustic Triangle understands, perhaps more than most, the significance of Erskine's words. Formed by British bassist Malcolm Creese with woodwind multi-instrumentalist Tim Garland at the turn of the decade, the trio's name is no exaggeration. Not only are their performances completely acoustic with no PA system to be found, their records are equally organic, recorded in churches with stunning natural resonance and minimal miking. Resonance - the trio's third release and the second to feature the line-up of Creese, Garland and twenty-something pianist Gwilym Simcock - is aptly-titled, referring not only to the richly-textured aural landscape they create, but also the deeply evocative chamber jazz they make. Previous discs were recorded live in church halls with no editing or post-processing, but Resonance is the first album to be recorded live in front of an audience. That the three musicians are experienced in classical and jazz worlds is immediately evident on Garland's arrangement of 17th century composer Gregori Allegri's "Miserere Mei." The room is truly the fourth member of the group, rich in natural reverberation as Creese's warm arco is joined by Simcock on French horn and Garland on soprano saxophone. Things become more intimate when Simcock switches to piano and the trio begins taking more improvisational liberties. That they can expand on Allegri's beautifully spiritual music without tarnishing its lyrical innocence is demonstrative of the distinctive language the trio has developed in surprisingly little time. The trio also continues its tradition of covering trumpeter Kenny Wheeler - in this case "Everyone's Song But My Own," one of the most enduring songs of Wheeler's large oeuvre. 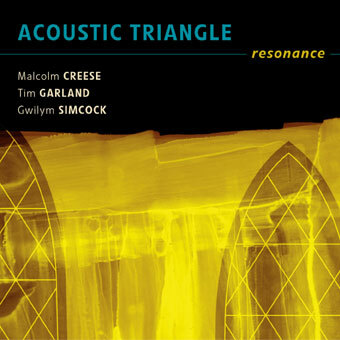 While Creese is most often heard either in support of Garland and Simcock or as an equal contrapuntal partner, he begins the tune with an imaginatively rhythm-based solo reminiscent of Dave Holland - evidence of his sadly undervalued status outside the UK. When Garland and Simcock enter it becomes the disc's most overtly swinging track, with Simcock's solo mature beyond his years and Garland's lithe yet robust tenor reason enough why Chick Corea continues to enlist him for projects including Origin and the upcoming The Ultimate Adventure. But Acoustic Triangle's real strength lies in Garland and Simcock's original compositions. Garland's bright "Bourdion" references one of his seminal influences, Ralph Towner, the combination of soprano sax, piano and bass feeling distinctly Oregon-esque. Simcock's "Ritual" inhabits darker and more impressionistic territory, with Garland's bass clarinet and Creese's arco bass developing Simcock's arcing theme. It's the combination of detailed through-composition and seamless improvisation that distinguishes Acoustic Triangle, and with Resonance the trio continues to develop its own language - chamber jazz as natural and compelling as it is complex and vividly multi-layered. Jazz and classical musical seem to be inextricably bound, at times strange bedfellows and at others when the music, and musicians, are right the results can be breathtakingly beautiful. On this recording, the music and musicians are most definitely right. This is the third album from Acoustic Triangle whose blending of classical and folk music with contemporary jazz has captivated all who have heard them. The previous two discs, the acclaimed 2001 debut album Interactions and the award-winning 2003 release Catalyst were recorded in the natural acoustic of St George's in Bristol under 'studio' conditions, the new album was recorded in Romsey Abbey, Hampshire and Dorchester Abbey in Oxford in front of an audience during the groups recent Tour Of Sacred Places taking in some 30 dates throughout the UK. The tour, a massive undertaking, found the band playing in sacred buildings from small chapels to vast Cathedrals, and utilising the superb acoustics provided by each individual location. This way of playing, without any amplification, not only brings the listener closer to the music with a fuller understanding of just how the sounds were created (no after-the-event editing or added reverb), but also forces the musicians to react differently to each other and the space in which they are performing. The dynamics of each instrument must be perfectly blended with the other musicians in the ensemble, requiring careful listening from all concerned. The music on this most satisfying of CDs has been carefully chosen not only to give a balanced feel to the set in terms of variety of dynamics and rhythm, but also to reflect the particular venue in which they are being performed. The opening number is Tim Garland's arrangement of the Gregorio Allegri's Miserere Mei (Have Mercy On Me), which finds each member of the trio occupying separate area of the building. This allows for a particularly inspirational dialogue between Creese's arco double bass, soprano saxophone and Simcock's French horn before he returns to his more usual place at the piano. Simcock also contributes some intriguing original compositions to go in tandem with his phenomenal piano playing. 'Ritual' has more than a passing reference the classical tradition that all three musicians embrace with a passion, whilst 'Nutshell' is more firmly in tune with the group's jazz sensibilities with a playful and conversational lines for piano and soprano. He also manages to sneak in a three minute improvisation, subsequently titled 'Solo Piano Interlude', that is pure fun off the cuff. Saxophonist, Tim Garland, also gets in on the composer credits with 'From The Land' featuring his lovely bass clarinet playing working with bass and piano, and a piece written especially for performances in large churches 'As The Boy Gathers His Dreams' that features his sumptuous tenor playing with a strong yet seemingly simple and effortless melody line that perfectly capture dreams of the young and innocent (the song is dedicated to his young son). Throughout, Malcolm Creese's flowing bass lines are clearly audible. Never one to over emphasise his role, he modestly keeps the engine room ticking over. Or so it seems at first. More careful listening reveals just how clever his musical thinking is. On the quietly reflective classical pieces and ballads his line is strong yet delicate, well chosen notes, and more importantly spaces, allow each to be considered and savoured. When he needs to increase the tempo and rhythmic thrust, again he is right on the nail, yet never forsakes his superb tone for the sake of speed. In short, Acoustic Triangle are to be treasured in the hope that this fruitful partnership should continue to grow and flourish for many years to come. These three world calls musicians are currently inhabiting a space all of their own, and should be supported on every step of their journey. Just listen to their interpretation of Stan Tracey's 'Under Milkwood'. Does it get much better than this? I think not. There is a sense of profound calm at the heart of the chamber trio led by the double basist Malcolm Creese. If you missed last year's Sacred Places tour, here is your chance to rest in a pew and savour the intimate group dynamics. Reeds player Tim Garland's setting of Allegri's Miserere makes a suitably pensive opener. On the originals, the interplay between Creese, Garland and pianist/French horn player Gwilym Simcock occasionally echoes the overly self-conscious dialogues of the venerable Azimuth. But the classical motifs are beautifully handled, and Simcock's Fundero is the cue for some effortless pirouettes. Jan Garbarek's million-selling forays with the Hilliard Ensemble show that there's a place for the jazzman in church. Now following them up the aisle are Acoustic Triangle, the brainchild of the bassist and lover of old buildings Malcolm Creese, who with the piano prodigy Gwilym Simcock and Tim Garland on saxes toured the churches of Britain last year. Recorded in the glowing acoustics of Dorchester and Romsey Abbeys, their lyrical chamber jazz stretches from Gregorio Allegri's 17th Century Miserere Mei via original material to Stan Tracey's Under Milkwood. The emphasis is on melody and subtle improvisation - though by the time they reach Simcock's dance-like Fundero there is a hint of swing too. Occasionally, you wish that the trio would embellish a little less and just enjoy the resonances of their venerable venues; nevertheless, their multilayered music gently draws you in. This remarkable trio - bassist Malcolm Creese, pianist Gwilym Simcock and Tim Garland, playing saxophone and bass clarinet - inhabits the rich borderland between jazz and classical music, and there is nothing quite like it. The music, recorded live in Romsey and Dorchester Abbeys, manages to be both serene and exhilharating, as the melodies expand in the naturally resonant spaces. These ten pieces range from Gregorio Allegri's 400-year-old Miserere Mei to Stan Tracey's Under Milkwood, but Simcock's Ritual and Garland's As The Boy Gathers His Dreams are the most absorbing of all. Anyone who's heard the pianist Gwilym Simcock in person knows that he's a star already, but here's incontrovertible proof. Recorded live at Romsey and Dorchester abbeys, where the spacious settings add a wonderful natural reverb to the repertoire of ten tunes, the co-op trio of Malcolm Creese (double bass), Tim Garland (saxes and bass clarinet) and Simcock (grand piano and tenor horn) succeeds in making chamber-jazz sound both lively and varied. The theme gradually emerges through the smoke and fog of site-specific atmospherics from bowed bass, soprano sax and tenor horn.